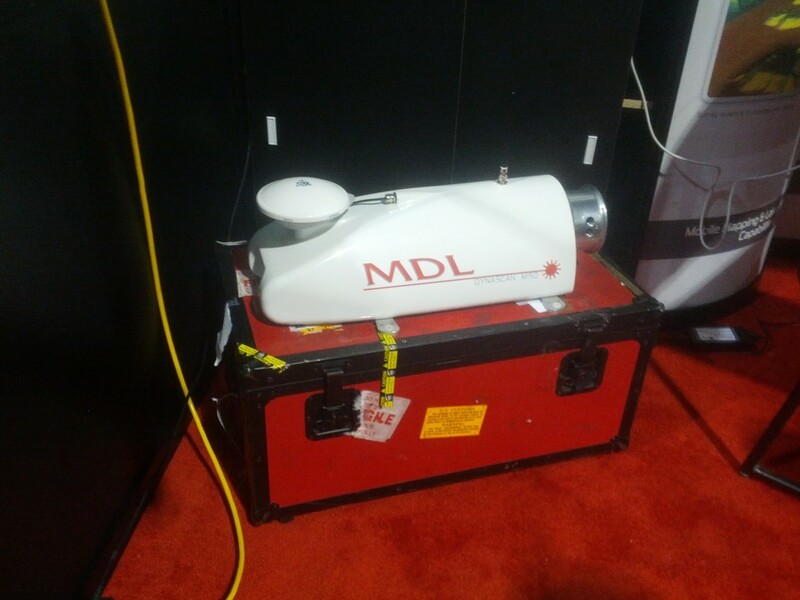 Two products of note in the LiDAR realm at MinExpo were manufactured by MDL – their DynaScan system for mobile scanning, and thier downhole C-ALS MK3 scanner. The DynaScan system is a mobile-mounted system designed to operate on a moving vehicle. 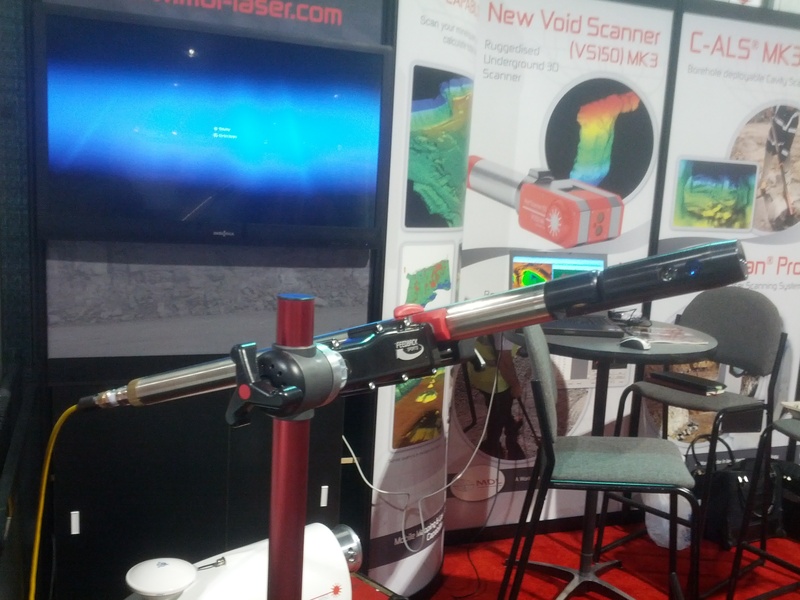 A Single-Beam DynaScan Scanner at MinExpo. This unit is designed to be mounted on a vehicle for rapid moble scanning. The disk on the left is the GPS antenna, and the chrome cylinder on the right end is the laser head. When used in conjunction with a pair of GPS antennas it is capable of self-backsighting for instant geolocation of the scan data. The unit is water-resistant and has been used on marine vessels for scanning beach cliffs, estuaries, and so on, whcih is probably not of major concern for mines except when a light rain shower happens to pass by during a month-end scan run. It is available in a variety of internal configurations to fit the needs of many users, with range capabilities of 100-500m depending upon the laser used, and from 1-5cm accuracy. Obviously the price of the unit will vary based on the specifications of the internals, and the base price starts at $130,000. One of the more notable features of the DynaScan system is an optional dual-head configuration – instead of having a single spinning prism to collect data as on their base model, the dual head option has two spinning prisms offset to 45 degree angles rather than vertical. The benefit of this configuration is best identified when scanning vertical objects – vertically-tending joints and faults will show up more readily with the offest heads. The reason for this is that with a vertical prism array, it would be possible to completely miss a vertical object if it happened to situate between scan lines. A good example of this would be a telephone pole – if the scan lines run vertical to either side of the pole, it will not be detected, but since the scan lines would be running across the pole at 45 degree angles, there’s no way the pole would be missed. The C-ALS MK3 downhole scanner. The right end of the scanner rod is the laser head. The entire unit is lowered into a drillhole to remotely scan a void. The C-ALS MK3 scanner is a downhole scanner intended to measure voids encountered with a drill rig, such as old underground workings mined prior to an open-pit excavation. This scanner is capable of calculating orientation of the rod as it run down the hole to accurately situate the void in 3d space upon scanning. It has a 150m laboratory range, so of course the practical range will vary. Hopefully a lesser range of 100m would be sufficient for most stopes though. More information on the MDL line of scanners can be found on their website.